1Universidad Autónoma de Hidalgo, Centro de Investigaciones Biológicas, Laboratorio de Genética, km 4.5 carretera Pachuca-Tulancingo, Col. Carboneras, 42184 Mineral de la Reforma, Hidalgo, Mexico. 2Universidad Autónoma de Hidalgo, Centro de Investigaciones Biológicas, Laboratorio de Ecología de Poblaciones, km 4.5 carretera Pachuca-Tulancingo, Col. Carboneras, 42184 Mineral de la Reforma, Hidalgo, Mexico. Cedrela odorata (Spanish cedar) is a tropical tree native to America with an important international trade market. In this study, the morphological variation of C. odorata was compared among three conditions: logging, plantations, and natural populations, with the objective to evaluate the current condition of managed populations after harvesting and in plantations, in contrast to relatively well-preserved populations. Two sites were chosen for each condition. The population density and four morphological attributes were measured: diameter at breast height, height, angle of branch insertion and crown form. A multivariate approach was used to compare the morphological variation among conditions (generalized discriminant factors analysis) and determine total variation distributed among size classes (cluster analysis), as well as assignment of these classes to each condition (canonical correspondence analysis). Four significantly different size classes were identified among all populations with specific association to condition. Strongest correlations were between highest trees with natural populations and small trees with plantations. Forest management, including harvesting and plantation conditions, reduced the phenotypical variation and modified the dasometrical attributes of C. odorata. The logging of the better shaped phenotypes increased the smaller size trees frequency compared to commercial size individuals, and changed the forest composition favoring small categories. The forest exploitation generates homogenization in median height-class and the plantation in lower height-class. In both cases, the harvestable trees are scarce, even after 20 years of management; and they are non-existent in plantations of 15 years. These results suggest that the removal of the highest trees, as well as forest plantations, are not being effective to wood production since they do not reach commercial sizes in the time of recovery or projected growth. Cedrela odorata (cedro) es un árbol tropical nativo de América con un importante mercado internacional. En el presente estudio, se comparó la variación morfológica de C. odorata en tres condiciones: bajo extracción, plantaciones y poblaciones naturales, con el objetivo de evaluar la condición actual de las poblaciones después de la extracción y en plantaciones, en contraste con las poblaciones relativamente bien conservadas. Se eligieron dos sitios para cada condición. Se midió la densidad poblacional y cuatro atributos morfológicos: diámetro a la altura del pecho, altura, ángulo de inserción de las ramas y forma de la copa. Se usó una aproximación multivariada para comparar la variación morfológica entre condiciones (análisis de funciones discriminantes generalizado), y para determinar la variación total distribuida entre clases de talla (análisis de agrupamiento); además, se asignaron esas clases a cada condición (análisis de correspondencias canónicas). En todas las poblaciones fueron identificadas cuatro clases de talla significativamente distintas. Las correlaciones más fuertes fueron entre los árboles más grandes con las poblaciones naturales y los más pequeños con las plantaciones. El manejo forestal, que incluye las condiciones bajo extracción y las plantaciones, redujo la variación fenotípica y modificó los atributos dasométricos de C. odorata. La extracción de fenotipos mejor conformados incrementa la frecuencia de árboles de menor talla, respecto a individuos de tamaño comercial, y cambia la composición del bosque favoreciendo las categorías pequeñas. El aprovechamiento forestal genera homogenización en clases de talla mediana, en cambio, en las plantaciones se homogenizan las clases de menor tamaño. En ambos casos, los árboles cosechables son escasos, aún después de 20 años de manejo, y no existen en cultivos de 15 años. Estos resultados sugieren que la remoción de los árboles más grandes, así como las plantaciones forestales, no son efectivas para la producción de madera puesto que no se encontraron árboles de tallas comerciales en el tiempo de recuperación o crecimiento proyectado. Spanish cedar (Cedrela odorata L., Meliaceae) is a tree native to the American tropics with high economic importance because of the quality of its timber, generating a very active international trade market. For this reason, it is considered the second most valuable tropical hardwood from the Neotropics (Cerrillo et al., 2013). To meet the high demand for this species, many countries have established extensive plantations in tropical forest and farmlands, including Asia, Africa and Australia (Russell et al., 1993; Gezahgne et al., 2004; Orwa et al., 2009). However, in most cases, the success of plantations is not evaluated under standardized criteria that consider disturbance regimes, genetic sources, management practices and forest types with different ecosystem functions, as basic topics proposed for evaluation of success in European management forests and plantations (Bengtsson et al., 2000). Several studies on established plantations of C. odorata have shown important differences on the survival and morphology of seedlings, depending on the maternal origin and environmental conditions. These findings suggest that the management of the plantation must be adjusted according to the specific parameters of each site (De Jong, 2001; Mexal et al., 2002; Healy et al., 2008; Negreros-Castillo et al., 2010; Hall et al., 2011; Gaburro et al., 2015). Cedrela odorata has been listed in the Appendix III of the Convention on International Trade in Endangered Species of wild fauna and flora (CITES, 2010), thus allowing free trade in some countries. However, in other regions the species has been protected by specific laws causing a potential conflict of use and trade (Herrero-Jáuregui et al., 2013). The IUCN Red List considers it as Vulnerable with A1cd+2cd criteria (Mark and Rivers, 2017), because its natural populations have suffered an important reduction of at least 80% over the last 10 years, with the greatest losses on the limits of its natural distribution range. Recently, C. odorata was listed in the Official Mexican Standard NOM-059-SEMARNAT-2010 (SEMARNAT, 2010) in the category “Subject to Special Protection” (Pr), which has caused some increase in the establishment of plantations. In addition, extensive extraction under different forest management practices and illegal logging has substantially changed the population structure within its native distribution area. Hence, well-conformed trees of commercial size (diameter at breast height >60 cm) are rarely found and such individuals occur in remote areas only (Cerrillo et al., 2013). Even when Cedrela odorata is considered as a fast-growing tree suitable for plantation production (Hall et al., 2011; Cunha et al., 2013), the time required to reach commercial size individuals can be up to 40 years with a yield of 445 m3/ha. Additionally, the high mortality of saplings could reduce those yields by lowering the amount of commercial size individuals at a number of 10 to 20 per hectare in plantations older than 20 years (Orwa et al., 2009; Plath et al., 2011). This low survival rate might be caused by the use of standardized management practices by the growers such as the Mexican Method of Managing Irregular Forests (known by the acronym MMOBI) and the Mexican Method of Managing Forest (known by the acronym MMOM) (Acosta-Hernández et al., 2011a). Both do not recognize the biological particularities of each species or its population dynamics, neither environmental conditions of the logging population, diversity interactions, infrastructure and planting schemes, giving priority to economic benefits and leaving aside the ecological ones (Klooster, 2006; Plath et al., 2012; Riedel et al., 2013). Other international strategies for forest management, based on community regulation and custody or logging concessions to private companies, are aimed to homogenize the forest morphology by extraction of the oldest, sick and malformed trees and/or planting monoculture forests with native or exotic wood species (Wiersum, 1995; Bengtsson et al., 2000; Bray et al., 2003). Recently, integrated use of forest resources, including non-timber products and ecosystem services, is recommended under the Multiple-Use Forest Management method in England and North Europe (MFM) (Soriano et al., 2012). In Mexico, natural populations of Cedrela odorata exist with more than 500 years of extraction history; especially on the Atlantic coast (Torelli, 1994). This region constitutes the northern limit of the natural distribution of the species (range from 26° N in Mexico to 20° S in northern Argentina) and populations are being reduced continuously by fragmentation and land use change (Navarro,1999). Government regulation is often ignored in Mexico due to the short-term economic benefits that people see in the exploitation of C. odorata. This is reflected in an unorganized extraction of young and mature, fertile trees, thus diminishing the natural recruitment with probable forest degradation (Bray et al., 2003; Soriano et al., 2012; Herrero-Jáuregui et al., 2013). There are also reports that suggest a higher number of pest attacks might be caused by genetic erosion of the populations of C. odorata in Mexico and Bolivia (Pérez-Salicrup and Esquivel, 2008; Cerrillo et al., 2013; Calixto et al., 2015). Environmental agencies in Mexico have included C. odorata in several conservation and protection programs since 2010. These included the establishment of strategies for seed collection, commercial propagation and prohibition of harvesting from natural populations (SEMARNAT, 2010). Unfortunately, many of those programs have failed due to several factors; one of the most important is the low survival rate of the seedlings and the subsequent abandonment of the plantations (Negreros-Castillo and Mize, 2008). In a few cases, the government provided technical support but due to poor pest control and the environmental conditions, only a few scattered individuals remained in the plantations. Similar strategies were promoted in a reforestation program 20 years ago. Likewise, the results of this program were unsatisfactory because the plants did not represent benefits to growers in the short and medium term (Cervantes et al., 2008). Such variation in management proposals and conservation strategies might enable us to compare the results of established plantations in the short (six years) and medium term (15 years); the first with known regional multiple seed sources and the second with monocultures that came from non-identified seed sources. The efficiency of the protection program for the recovery of populations with an extraction history (special protection program) and the evaluation of scarce wild populations are still present in the central region of Mexico. 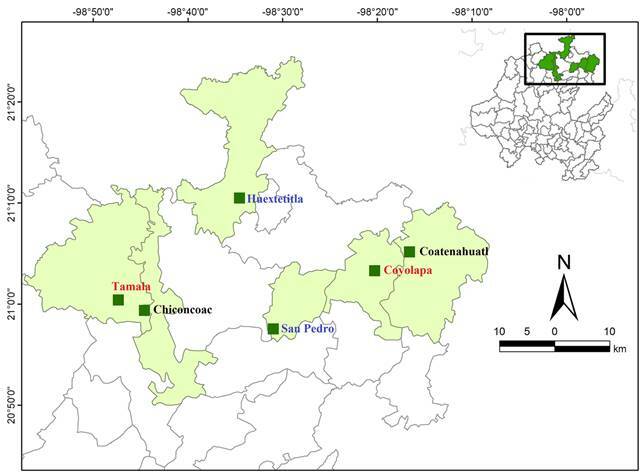 Hence, the aim of this study was to compare the morphological variation of C. odorata trees among: i) established plantations at short and medium term, ii) logging areas under the MMOBI strategy, and iii) natural populations from central Mexico; by using a multivariate approach to evaluate the population structure after implementation of the management strategies: plantations and directed logging compared to the natural tree structure of the populations. Six populations of Cedrela odorata, natural and under different management conditions were analyzed (Fig. 1). Based on the information provided by the National Forestry Commission of Hidalgo, Mexico, two growers who participated in different reforestation programs were selected to obtain a representation of plantation populations. Likewise, several other owners were contacted to locate the populations under logging conditions. Finally, two preserved natural populations were included. In summary, two populations were chosen for each management condition (logging, plantations and natural conditions). In the first logging site located in Coyolapa, municipality of Atlapexco (POP1) the wood extraction was performed for 20 years ago (1990's) under the parameters of the MMOBI program focusing on the harvesting of the old, sick and deformed trees; the extraction in this population was supposedly suspended in 2010 because of the inclusion of the species in Appendix III of CITES. At the second logging area in Tamala, municipality of Tepehuacán de Guerrero (POP2), the same harvesting management program was established (MMOBI) in the 1980´s, and was also suspended in 2010 because of the same reason. The first plantation site located at San Pedro, municipality of Hualazingo (POP3) was established from multiple regional seed sources since 2012, based on the Strategy for Increasing Productivity and National Forestry Productivity 2013-2018 (CONAFOR, 2013). The second plantation in Huextetitla, municipality of San Felipe Orizatlán (POP4) was established from unknown seed sources since 2003 based on the Mexican Strategic Forestry Program 2025 (SEMARNAT-CONAFOR, 2001). Finally, both natural populations (POP5 at Chiconcoac, municipality of Lolotla and POP6 at Coatenahuatl, municipality of Huautla) were found in areas of difficult access and are isolated on steep slopes (Table 1, Fig. 1). Figure 1: Geographical location of study sites on Hidalgo, Mexico. Table 1: Study sites with geographic location and type of condition by population of Cedrela odorata L. in Mexico. On each site, a quadrant of 100 × 100 m was established and all trees within this area were mapped to evaluate the spatial density of individuals (density =# individualsarea× 10,000) (Aguirre-Saldado et al., 2015). Four morphological attributes were registered to describe most of the variation, as previously reported by Cunha et al. (2013): diameter at breast height in centimeters (DBH), height in meters, angle of branch insertion in grades (ABI) measured with a clinometer (SmartTool, Chicago, USA) from the base of the first branch; and crown form (CF) based on six ascending classes, 1) buds, 2) few branches, 3) less than half a circle, 4) half circle, 5) irregular circle crown, 6) circular crown (Acosta-Hernández et al., 2011a, b). Morphological variation was compared by Generalized Discriminant Factor Analysis (GDFA) to establish significant differences among trees from cultivated (plantations of six and 15 years), logging areas (harvesting of 20 years ago under MMOBI strategies before the especial protection program implementation) and natural (wild populations) conditions. DBH, height and ABI were taken as continuous predictors; the CF and origin were taken as categorical factors in the GDFA analysis. A total morphological classification of individuals was made by Cluster Analysis (CA) based on Euclidian distances and a Ward´s method of agglomeration to have the full range of variation possible regardless of the conditions allowing the identification of any phenological category or the loss of them by extraction; the number of estimated clusters was determined by the maximum accumulative variation shown by the plot of the amalgamation schedule. Finally, a Canonical Correspondence Analysis (CCA) was made contrasting conditions and obtained morphological classes using two dimensions that explain 100% of Inertia. All analyses were made in STATISTICA v.10 software (Statsoft, 2011). A total of 186 trees were evaluated in this project. In general, the population density was different depending on the growing conditions. The highest density was found in plantations (178+140 individuals per hectare), followed by logging areas (130+76 individuals per hectare) and the lower in natural populations (64+6 individuals per hectare); specific densities of each site are shown in Table 2. Size traits: the height of the individuals was similar in all sites under all conditions, although the diameter of the tree trunk is larger in natural conditions (DBH: 52.80+47.16) (Table 2). Form traits: the CF had better conformation (irregular circle to total circular form, 4 to 5 respectively) when the ABI had a greater angle, which increases the diameter of the tree-top (Table 2). Table 2: Morphological description of Cedrela odorata L. individuals under different conditions. Number of individuals evaluated (N), Individuals per hectare (Ind/ha), Diameter at breast height (DBH), Commercial-sizes trees (>60 DBH) (CST), Angle of insertion of branches (AIB), Crown form (CF). The GDFA showed a statistically significant difference between the two management conditions and the natural populations (F(7.177): 74.49±31.27, p<0.0001) explained by two discriminant factors (F1 eigenvalue: 4.6, Wilk´s λ: 0.084, χ2: 445.18, df: 14, p<0.0001; F2 eigenvalue: 1.11, Wilk´s λ: 0.472, χ2: 134.98, df: 6, p<0.0001), with a percent of correct assignation by the model of 94.08% (managed-extraction: 100%, plantations: 98.87%, natural: 68.75%). The failed assignation of trees from natural populations was due to high heterogeneity of tree conformation. The first factor (F1) had a positive and significant correlation with DBH (r: 0.49, p<0.05), and a negative correlation with logging conditions (POP1 r: -0.876, POP2 r: -0.928, in both p<0.01), explaining a cumulative proportion of variance of 80.47%. The second factor (F2) had a positive and significant correlation with DBH (r: 0.56, p< 0.05) and CF (r: 0.51, p<0.05) and a negative correlation with young (6 years) plantation conditions (POP3 r: -0.84, p<0.01), explaining a 19.52% of cumulative proportion of variance (Fig. 2). 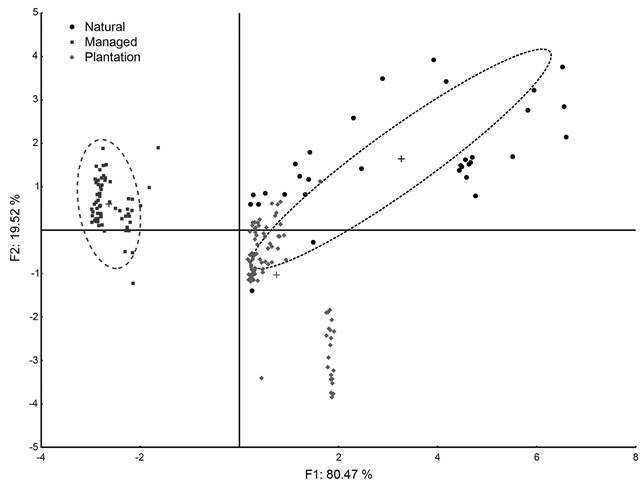 Figure 2: Generalized Discriminant Factor Analysis (GDFA) plot of Cedrela odorata L. individuals under different management conditions. The cluster analysis showed four morphological classes named according to size (Height and DBH) and age (according to the establishment of the plantations), with a greater abundance of little and small individuals and a lower abundance of medium and large trees (Table 3, Fig. 3A). All of these size categories were proportionally distributed differently between conditions (Fig. 3B). The large trees had an irregular circle crown, while the rest of the classes showed a similar tree-top conformation with less than half circle (Table 3). Table 3: Morphological description of Cedrela odorata L. categories formed by the cluster analysis. Number of individuals per category (N), Diameter at breast height (DBH), Angle of insertion of branches in grades (AIB), Crown form (CF). Figure 3: A. cluster analysis based on Euclidian linkage distance and Ward's agglomeration method showing four morphological classes; B. morphological class distribution of Cedrela odorata L. depending on management condition. The CCA revealed an association between large trees and natural populations, the medium size trees were equally distributed between logging and plantations, small size with logging area conditions and little trees with plantation. All of these relations were formed on the first axis of variation (93.02% of Inertia). 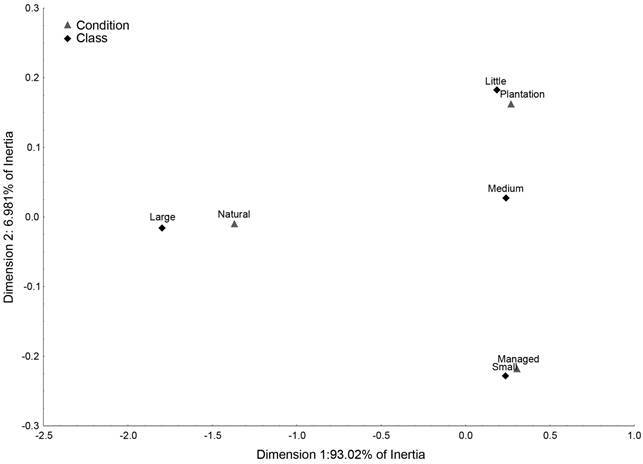 The associations between little and small size trees with plantations and logging, respectively, were maintained on the second axis (6.981% of Inertia), although this dimension showed an association of medium and large size trees with natural populations (Fig. 4). 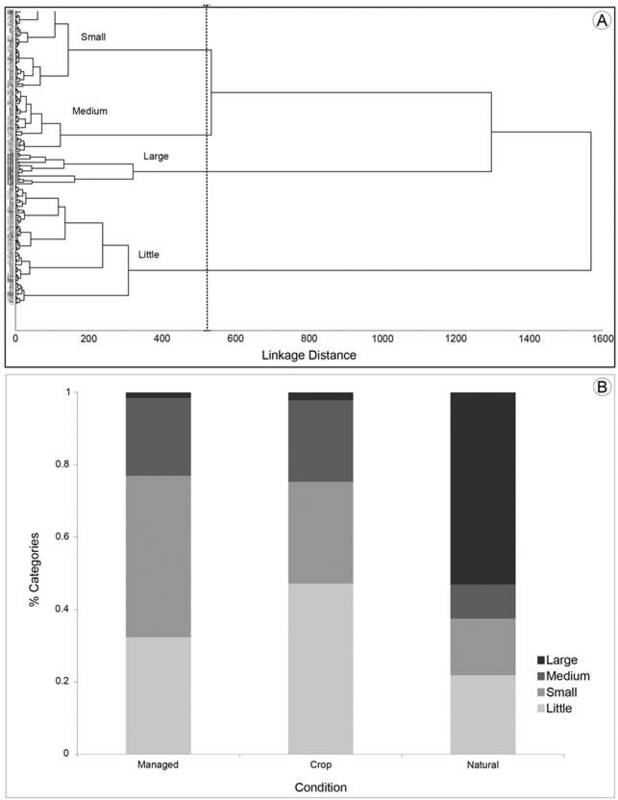 Figure 4: Canonical Correspondence Analysis (CCA) between management condition and size class of Cedrela odorata L. trees. The obtained results suggest that the extraction practices of C. odorata have modified the morphological attributes of trees, in particular DBH and CF, by extraction of best conformed crowns, decreasing the frequency of the commercial-reproductive size class (higher than 20 cm of DBH, Zuidema et al., 2009) and dominance of small size category. Supposedly the management strategies are aimed at selective removal of old-infertile, sick and deformed trees; as well as selection in a vertical structure, regardless of age and height, of the better trees to promote regeneration and development of young trees to achieve the expected commercial size (MMOBI, Hernández-Díaz et al., 2008). Under the MMOBI program, it is expected that a distribution of diametric frequencies has normal structure type Liocourt, which ensure continuous regeneration and natural mortality. A recovery of the populations POP1 and POP2 (logging areas) would be expected by inclusion of C. odorata in Appendix III of CITES (2010) and NOM-059-SEMARNAT 2010 (SEMARNAT, 2010). However, the greater frequency of small size trees (Figs. 3B, 4) does not correspond to the Liocourt structure, even though the extraction activities had been interrupted; these suggest other causes of variation consumption. Additionally, eight years without logging do not show the expected regeneration because only one of 65 trees had the harvesting category. The phenotypic diversification, mainly in logging areas, can be used as an indicator of adaptive responses because the morphological variation and diameter is highly correlated with growth progression and wood potential production (Gutiérrez-Vázquez et al., 2012). About categorical traits, the crown form is correlated to forest gap dynamics and phenologic processes of the species (Amarasekara and Denne, 2002; Asner et al., 2004). This pattern has been shown in Cedrela lilloi C. DC. in which the forest morphology structure had a negative exponential size/age distribution conditioned by a gap-phase regeneration model but modified by a density dependent mortality in old phases (Grau, 2000). Therefore, morphological variation presents a genetic component, and its interaction with the environment makes certain selective pressure on the phenotypes, resulting in different adaptations what is known as phenotypic plasticity. With respect to the diameter and crown form, management could be considered as a selective factor that consumes variation necessary for adapting to environmental changes, resulting in irregular circle crowns, small trees and high density dependent mortality in old phases, but increases the density of young phases by gap-dynamics (Grau, 2000; Acosta-Hernández et al., 2011b; Cunha et al., 2013; Tlaxcala-Méndez et al., 2016). Our result of higher density in logging areas compared to natural populations supports this affirmation by its high frequency of small trees. Our results on the low frequency of little size trees, high frequency of small trees and irregular crown form in Spanish cedar logging populations could be caused by a non-registered wood extraction that was focused on the highest-fertile and commercial trees (DBH over 60 cm). Similar results have been found in other species and tropical trees such as Cariniana ianeirensis R. Knuth, Cedrela fissilis Vell., Ficus boliviana C.C. Berg, and Swietenia macrophylla King, in which the recruitment and demographic structure were negatively affected by illegal logging (Park et al., 2005). On the other hand, in previous studies, the growth rate of C. odorata has shown to be fast with a plant architecture dependence of the environmental conditions (Orwa et al., 2009; Hall et al., 2011; Cunha et al., 2013). Gratzer et al. (2004) mentioned that the growth rate and survival of tropical tree species was lower at high latitudes in North America; in contrast, several Nearctic species had an inverse pattern. Additionally, modeling of long-term impact of selective logging on the demographic structure of four Neotropical species (Bagassa guianensis Aubl., Hymenaea courbaril L., Manilkara huberi (Ducke) A. Chev., and Symphonia globulifera L.f.), sympatric with C. odorata, showed that recovery of the demographic structure after a logging activity requires more than 45 years, even in tropical latitudes (Sebbenn et al., 2008). Therefore, the recovery of cedar at subtropical latitudes at the extreme north of its distribution (Hidalgo, Mexico) could be even slower. Similar results were observed in the extreme southern distribution of C. odorata in Brazil, where a low survival rate and higher pest susceptibility to Hypsipyla grandella Zeller were found, particularly in trees with a diameter lower than 8 to 12 cm (Pereira et al., 2016). This increased pest susceptibility of C. odorata at the limits of its natural distribution range was corroborated by Cavers et al. (2003) and it might be related to low genetic variation (Calixto et al., 2015). About this, punctual observations of infestation by H. grandella were made only in logging area POP2 and plantation POP4, both in little and small trees categories (DBH less than 12 cm). In both plantations exist a dominance of little size class trees and the presence of some wider trees on 15 year old compared to six years old plantations; that were an effect of few individuals presence; both frequencies increased the heterogeneity in the plantations (POP4, DBH 16.25+11.37 cm). The plantation objectives are the preservation of the species, homogenization of any plantation and obtain a continuous sustainable wood production (Piotto et al., 2003; Loza et al., 2006). With respect to Cedrela odorata, a poor wood production by absence of trees with diameters over 60 cm (commercial size), even in the 15 year old plantation and the increase of size heterogeneity, questions the success of the mentioned objectives. Loss of phenotypic variation in tree species, caused by directional selection during seed production, has been reported under cultivation conditions in which seeds are collected only from a few individuals (Van-Pelt and Sillet, 2008; Bettinger et al., 2009). This could affect the canopy structure, crown form, reproductive output, seed germination and recruitment in the short term, with a homogenization of genetic variation and intensification of the offspring mortality (El-Kassaby, 1995; Ishii et al., 2000). In the case of plantations, seed source was unknown; however, a preliminary genetic analysis showed poor genetic variation in old plantations (15 years) compared to young plantations ((six years), unpublished data). This genetic variability could be related with the low morphological variation registered in the plantations. With respect to density, in tropical forests the individual’s aggregation is related with the soil quality, canopy cover, forest gap-dynamics and tree seed source persistence in surrounding areas (Snook, 1996; Barroso et al., 2011; Aguirre-Salado et al., 2015). Therefore, in open habitats the survival of seedlings might be compromised by desiccation, predation or mortality by competence for space, decreasing the success of propagation programs (Cervantes et al., 2008). In this study, individual density was higher in plantations, this management strategy aimed at increasing density to simplify the selection and harvesting of wood, unlike forests where only 30% of its area can be extracted (Loza et al., 2006). With respect to this, POP4 (old plantation) was planted under a standard scheme of 10,000 individuals per hectare on hills; in contrast, POP3 (young plantation) was planted on flat lands with a separation of 6 m between individuals at 5000 ind/ha density (CONAFOR, 2013), the actual density represents only 2.76% and 1.56% of survival, respectively. These results suggest that slopes help the survival of individuals on plantations by difficult accession that limited the logging or land use change, among other factors that support major survival, observed in the old plantation. In the study area we observe indiscriminate use of Cedrela wood for low quality furniture even of undeveloped trees, use of young trees as fuel source, illegal exploitation of protected populations and the abandonment of most plantations; situations which place into doubt the follow-up of management programs. For C. odorata the monitoring of plantations might be necessary to ensure that individuals reach commercial sizes without mortality by competition which subsequently results in economic loss (De Jong, 2001; Mexal et al., 2002; Negreros-Castillo et al., 2010; Hall et al., 2011). Finally, we suggest consider a substantial restructuration of the actual forest management programs for C. odorata, considering the evaluation of genetic resources, identification and evaluation of potential seed sources, fertility quantification, and wood production capacity based on biodiversity conservation (FAO, 2007; Hernández-Díaz et al., 2008). All these parameters will need to be considered for each specific locality. Cedrela odorata is a tropical tree susceptible to logging. However, the selective extraction of well-formed adults changes the morphological structure of trees in logging areas, homogenizing in middle-size classes and eliminating both small and commercial trees even after eight years without extraction. Farming could be a solution but only at the long term, because of the incipient development and increase of heterogeneity in old plantation, questioning the success of this management. Writing, statistical analysis, data sampling, field work and design of the methods were realized by DMGH and POA; data sampling, field work and community interviews were performed by MAMV and FFNCG; ASG made methodological corrections and suggestions. To Jonathan Silva Chávez for the field work. This research was funded by the “Consejo Nacional de Ciencia y Tecnología”: 1245, Catedra project to FFNG and posdoctoral grant 316763: “Acervo genético forestal del estado de Hidalgo: Estudios sobre Cedrela odorata, Magnolia dealbata y Fagus grandiflora”, to DMGH.